Does not include Tape Roll. 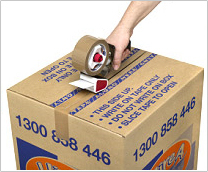 Our tape dispensers not making taping up the boxes fast and stress-free. People typically don’t realise just how long it takes to tape a bunch of boxes (along with cutting the tape) takes without using a dispenser. Save time and hassle using our extra strong tape dispensers – and the beautiful part of it all is that you can hire one for only $8.00. If you have never used a tape dispenser before, the driver can demonstrate how to use it at the time of delivery. You will never want to tape boxes again without one! Please note no tape rolls are included with the hire of a tape dispenser, you can buy them separately.